Manhattan, NY Designer Montroy Andersen DeMarco (MADGI) has completed the 20,343 s/f NYC offices and production studios of Jupiter Entertainment, a television production company working in a wide variety of genres and formats for channels such as A&E, Animal Planet, Discovery, Fuse, History, Investigation Discovery, Oxygen, TLC, TrueTV, and TV One. The offices and studios are located on the fourth floor of 136 Madison Ave., between East 31st and East 32nd Sts. 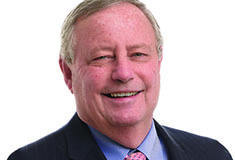 Jupiter is a tenant of Colliers International Group, which owns the building and retained MADGI to design the new facility. “As a full-service television production company, we had some specific design requirements for offices and production facilities. 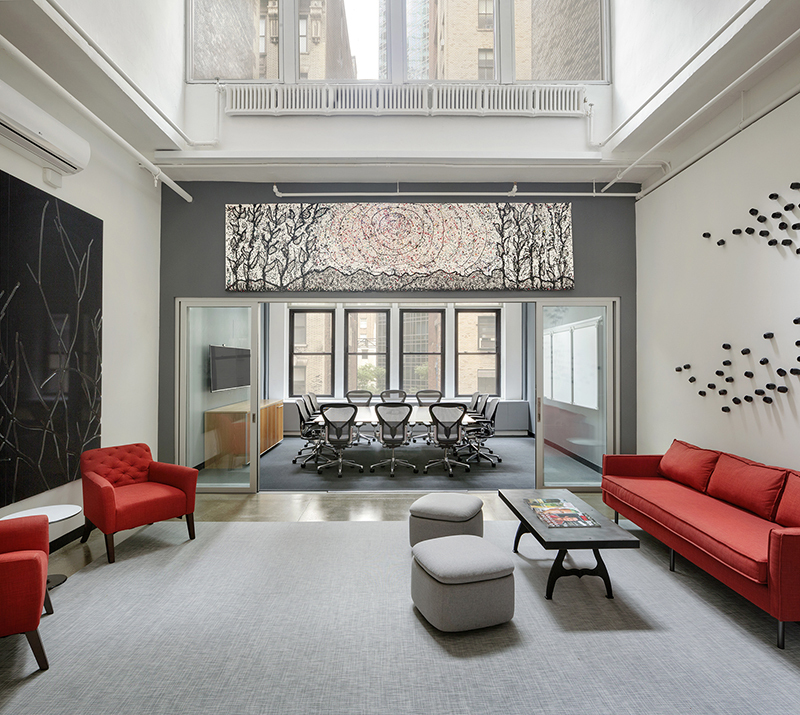 Our new NYC space accommodates several functions – an attractive environment for hosting clients, a comfortable workspace for our employees, and efficient and functional editing suites,” said Jupiter Entertainment general manager Robert Twilley. The general contractor was Phase 3 Associates and the mechanical, electrical, and plumbing (MEP) engineer was MG Engineering. 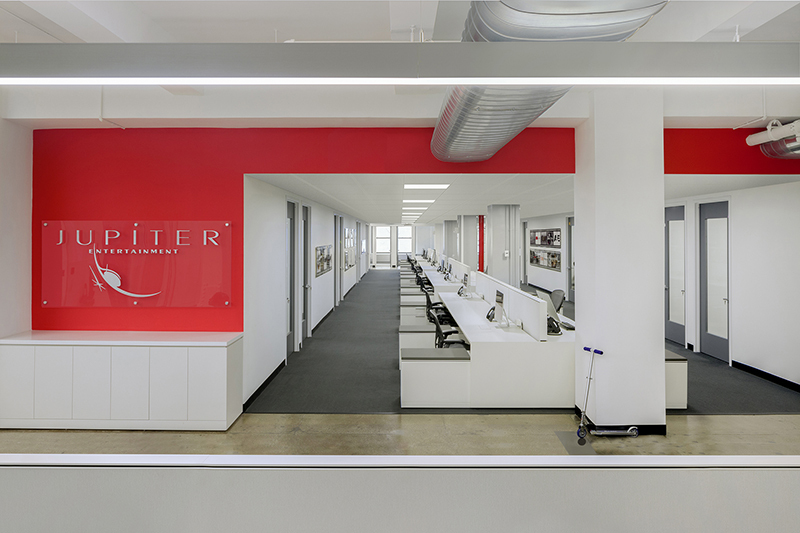 Before Jupiter leased the floor, Colliers asked MADGI to fit out the full floor to serve as a marketing center to attract tenants to the building. It was to feature a conference room, reception area, pantry, and restrooms using a variation on the building’s standard finish. When Jupiter came on board, MADGI changed the program and performed a test-fit to ensure the space would suit the production company. The pantry’s base cabinets are all black with rattan-wood laminate as the upper cabinets and a gray Caesarstone countertop. Small white square tiles provide a contrast for the space, forming the pantry’s backsplash. 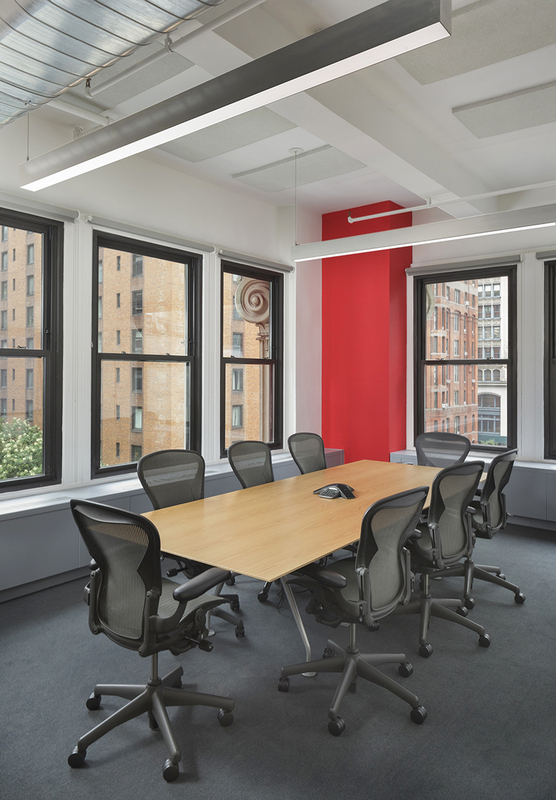 In addition to the annex conference room, there are two eight-to-10-person conference rooms and an informal huddle space along the floor’s Madison Avenue and 31st Street perimeters. As Jupiter’s editors require low light, the 24 edit bays, each at 7’x9’, are located facing the interior of the floor. The insets in the dark grey doors provide the only glazing in the otherwise opaque rooms. “We specified additional power and data for these rooms,” said Interior Designer Shauna Dack. “In fact, they have three times the power and data than what would be in a typical office space,” she continued. The team also included a few areas of open workstations where editors can work away from the confines of the edit bays. The team upgraded the mechanical system as part of the base building work, and renovated the bathrooms. Design-wise, MADGI specified a balanced look, with bright red wall sections contrasting a neutral white-and-gray color palette. “To complement the polished existing concrete floors we chose to specify gray monochrome carpet in the meeting rooms, offices, and workstations,” said Job Captain Allie Roberson. “Painted concrete ceilings and new flat-spiral ductwork were used to accentuate the 12-foot-high ceilings, while a 2’x2’ drop ceiling was used above the open workstations in order to hide edit bay wiring and provide for acoustic buffers.” Depth was added to the floor through the judicious use of light-gray convector covers and accent walls of dark gray and red. These were peppered throughout the space, such as in meeting rooms and on columns. Throughout the office spaces, MADGI specified charcoal and white furniture with light gray tack-board surfaces. According to Dack, “The office furniture is custom – we used a standard Herman Miller product furniture line and incorporated our own revisions to create a variation specific to Jupiter’s needs. The offices have minimal storage with adjustable worksurface levels – there’s a work surface, storage drawer, and a tackable surface on the wall.” One of the offices has a sit-to-stand desk. The workstation areas are open-plan spaces, with low panels and minimal storage. They have a work surface, side storage drawer, and a seat pad for collaborative purposes. The conference room furniture is all wood. Nienkämper is the manufacturer of the three conference tables and accompanying credenzas. The Herman Miller reception desk has a wood-panel front and a transaction top. Throughout the space, Stylex guest chairs are white, black, and red, with additional West Elm accent lounge pieces in red and gray. 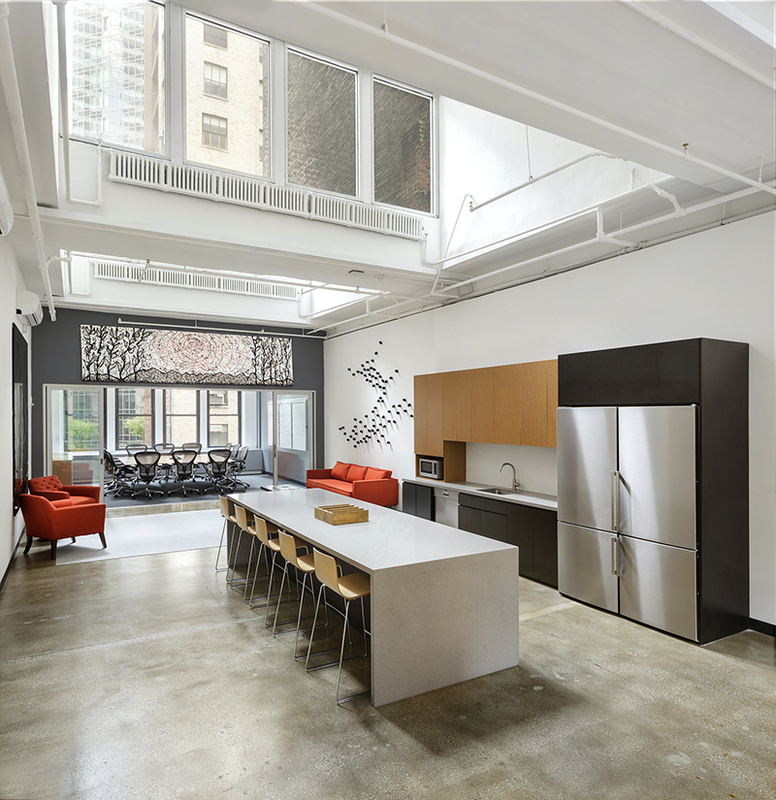 The large open pantry and social space includes a hotel table and bar seating. Benhar Office Interiors was the furniture dealer. Linear LED lights were used throughout the space except in the 2’x2’ tile ceiling. For the reception and meeting rooms, MADGI specified 4’x8’ rectangular linear LEDs to create accent spaces. The bathrooms feature white subway tile and stainless-steel partitions. All of the LED lights in the bathrooms were recessed, as each has a drop ceiling. In addition, there is a backlit individual mirror for each stall. Several items presented technical and logistical challenges for the team. For one, the schedule was tight: only four months. “Creating a precise schedule and closely coordinating furniture deliveries were keys to making the project run smoothly,” explained Roberson. As the electrical load was greater than in a typical office, MADGI had to figure out how to fit all the conduits into the walls. For example, all electrical and data cords had to go through the walls above the glass partitions in the offices closest to the pantry. The drop ceiling above the workstations also allowed the team to conceal cables there. The meeting room by the reception area, the one that seats up to eight participants, was much narrower than a typical conference facility. MADGI selected furniture that both worked with the room’s dimensions and would allow for a functional layout. They removed the existing convector cover for a more retro-looking iron radiator, which also adds to the character of the space. The informal huddle space, by the 31st Street elevator lobby, had a similar issue and the designers decided to relocate it so that it did not interfere with the fairly low windowsill. Finally, Jupiter required a great number of edit bays. Finding room for all of them while still maintaining an open “techy” feel was a challenge. MADGI performed several test fits and made sure the final layout would adhere to the client’s preferred look and feel.